Café sur le balcon est une belle façon de commencer la journée à Bracaway! Regarder le lever du soleil illuminer la mer. Peut oiseaux et quelques fous frégates seront par la flambée. Situé sur la lagune du côté sud, ce condo a baignade et la plongée exceptionnelle ..... ou vous pouvez simplement vous allonger au soleil sur la plage ou à la piscine. Le lagon est à l'abri des vagues et le surf qui peuvent limiter les activités nautiques dans d'autres domaines pendant les périodes de mers agitées. Un grand quai de double pont (le seul de l'un sur l'île) est situé sur la propriété. Nous recommandons un voyage de plongée de nuit sous le quai pour une aventure passionnante! Travers de la route en face est un vieil étang de mangroves où certains oiseaux aquatiques intéressante peut être vu. Les propriétaires vivent sur l'île et seront heureux de fournir des informations sur la plongée en apnée et de plongée sites, grottes, sentiers de bois arrière et de randonnées, etc. Breakaway de l'ordinaire ..... Bracaway offre la vraie paix et la tranquillité ne trouve pas dans ces lieux de vacances surpeuplées. NEUF! Pour ceux d’entre vous qui ne peuvent pas s’échapper totalement, il existe maintenant un accès WIFI individuel pour cette unité !! Recherchez notre page Facebook: Carib Sands 221 - “Bracaway"
Comfortable and clean condo with all the amenties you could want for a terrific, relaxing snorkeling vacation to Cayman Brac. The secure private internet connection in the condo was a big plus, and the hammocks on the second level of the dock were great for afternoon reading marathons. The warm and friendly owners were happy to share their extensive knowledge of the island's history and wildlife and they provided a booklet with detailed information about the diving and snorkel spots around the island. Loved meeting you two. Thank you for the contribution to our wildlife fund. Hope you'll stay in touch and let us know when you may return. Fantastic condo in convenient spot. Unbeatable! This is a wonderful and charming condo in a great location. We loved this location. It is very close to the resort and dive shop and they will even pick you up at the doc right at the property. We mostly did beach diving which was also great because we picked up our tanks about 1 block away. The condo is equipped nicely and had every amenity we needed. This was our first visit to Cayman Brac, but we have been to Grand several times. There is much less bustle on the Brac and we are planning to come back as soon as we can. World class diving and world class rock climbing in the same location with extremely friendly people and great food, just unbeatable! Charming guests who were enthusiastic and took care of the property. We certainly would love to see them Brac. Apartment was clean and comfortable. Owner was very accommodating. Easy access to Brac Scuba Shack from dock. Nice to have you visit the Brac. Hope you'll be back. The condo we rented for the first two weeks of 2019 was great for our purposes. The owners picked us up from the airport, took us to the food market the next morning, and returned us to the airport for our outgoing flight. There were several good restaurants within easy walking distance, and the condo complex pool and the nearby two level dock were perfect for hanging out. 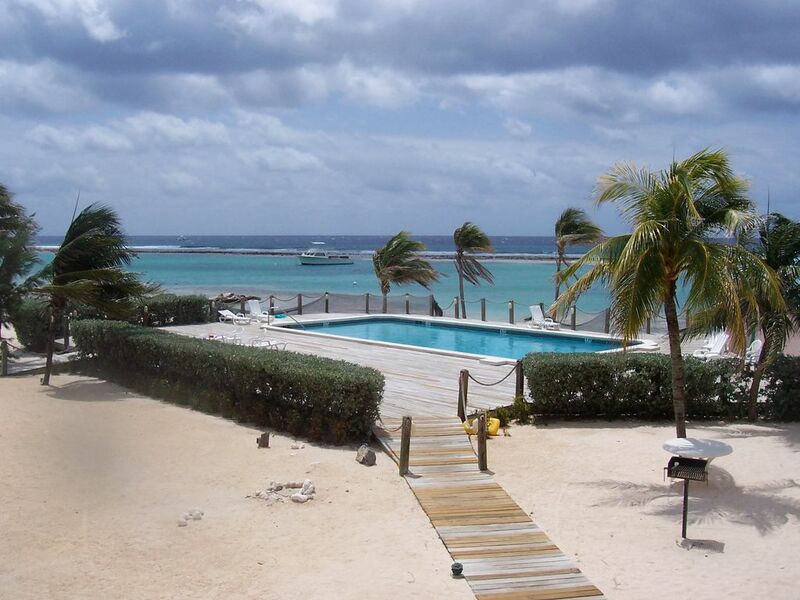 We would recommend this property for others wanting to spend time on Cayman Brac. Glad to have you visit the Brac and hope you'll recommend us to your friends! Great vacation condo! Clean, quiet and close to the dive shop! Bonnie was wonderful! She and her husband picked me up at the airport, drove me to the grocery store and liquor store and also showed me where the dive shop and car rental place were before dropping me off at the condo! I made great use of the hammocks on the dock and despite some crummy weather, it was a fabulous dive vacation! Brac Scuba Shop was absolutely top notch and took me on several guided shore dives when the boat couldn't get out due to the weather. Highly recommend this dive shop. Four D's car rental was right next door and offered great rates for staying at this condo plus an easy pickup/drop off of the car. Overall, I highly recommend this condo! Very convenient location. Not too crowded. Laid back feeling. Had all the conveniences you would want on vacation. We enjoyed meeting Angie and her family. They were great guests who left the condo in perfect condition.